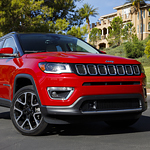 What Exterior Features Are On The New Jeep Compass? The Jeep Compass is one of the most recognizable and popular compact SUV's on the road today. This is largely because of the various exterior features included in this vehicle. That is why we here at C.H. Urness Motor Company located right in The Dalles want you to know all about the new 2019 model! First, car buyers will want to check out the extremely bright chrome tips on the exhaust system. It gives the car a unique look and a higher, quality appearance. Also, drivers will love the available power lift gate. Simply touch a single button the liftgate will either open or close. This makes loading or unloading the car easier than ever. Finally, drivers will love the adventure of selecting one of eight available wheel designs. This allows every buyer to put their own flair on the vehicle by selecting a design that best matches their unique style.